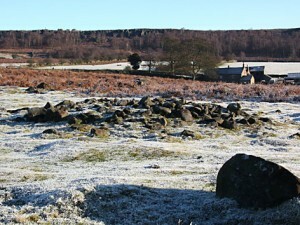 The prehistoric remains on the moors above Baslow and nearby parishes are of national and international significance. They were well populated in the Bronze Age, say 2000 to 1000 BC ago with huts, fields, stone circles and burial and clearance mounds. At the end of the period the weather deteriorated, the farmers left. Apart from summer grazing, there has been little disturbance since, so the many remains are intact though not always obvious. 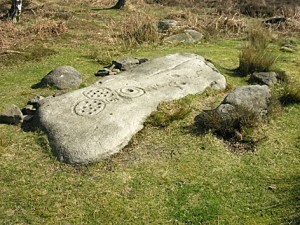 Of particular interest are the stone circles, of which there are several in the area. 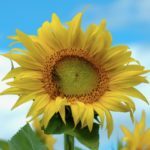 They would have been important to the people in many ways, one of which was astronomy – (they were used to follow the position of the sun and moon.) Another feature in the parish is the hill ‘fort’ or enclosure above Gardoms Edge. 12 acres are enclosed by an embankment, originally 2 metres high and still easily recognised. It was likely to have been a gathering place rather then a fort. The trees centre left are above Gardoms Edge. To the left of the trees are many Bronze Age remains. Beyond the trees is the ‘fort’ (see above). Note the track ways on the bank on the right. This is a probably a clearance rather than a burial mound. It is amazing to think that these stones were put in place over 3000 years ago. 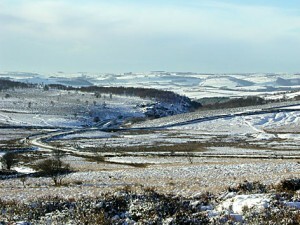 Moorside Farm and Nelsons Monument are in the background. 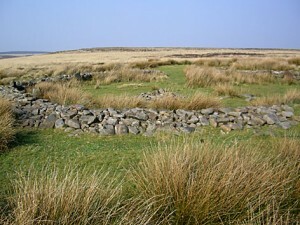 This stone circle is near Little Barbrook reservoir with the Owler Bar road just over the horizon The embankment has been reconstructed to show its original appearance.